Ennore Port Limited Recruitment 2017 has announced huge recruitment for freshers and experienced candidates. It has released for 15 Junior Executive, Senior Manager(Pilots), Chief Manager (Dock Master), Junior Executive (Assistant Hydrographic Officer) Posts. 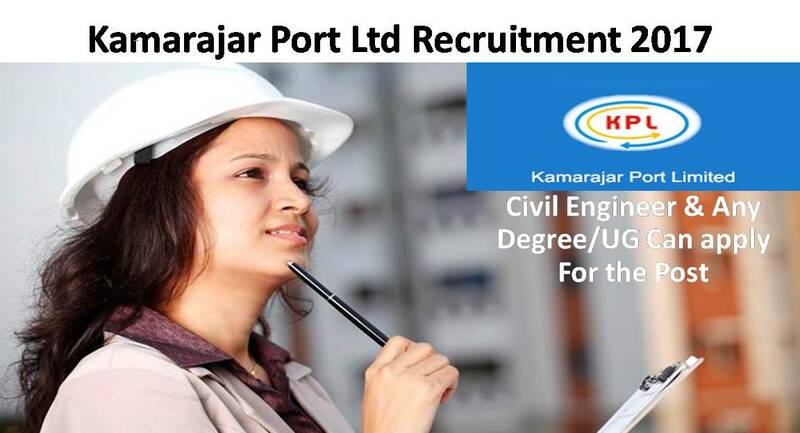 Kamarajar Port Limited Junior Executive Posts. they have published application for applying candidates. Now, its very easy to apply from online. Want to apply for it? Here we have updated all basic information such as interview, eligibility criteria, Offline registration processes, payment of prescribed application fee/intimation charges, Kamarajar Port Limited pattern of examination, Kamarajar Port Limited Syllabus, Kamarajar Port Limited Question Paper, Kamarajar Port Limited Admit Date Release Date, Kamarajar Port Limited Exam Date, Kamarajar Port Limited Result Date. Want to apply for it? now check below all details. Age limit range: age Limit Should not (For Post 1, 2 - 50 Years), (For Post 3, 4 - 30 Years), (For Post 5 - 40 Years), (For Post 6 - 35 Years). The Upper age limit is relaxed by 5 years for SC/ST; 3 years for OBC, 10 Years for Persons with Disabilities (15 years for SC/ST PWD’s & 15 years for OBC PWD’s) and for Ex-S as per Govt. of India rules. Candidates Relaxation in Upper Age limit will be provided as per Govt. Rules. a. with self-attested photocopies of Certificate and Marks Sheets in proof of Educational Qualification (X Std / SSLC onwards) including certificate of competency (F.G) and CDC. c. SC/ST Category candidates should attach self-attested photocopy of Caste Certificate issued by the Competent Authority. d. OBC (Non-Creamy Layer) category candidates should attach self-attested photocopy of recently obtained community certificate issued by the Competent Authority in the prescribed format (not older than 6 months as on date of advertisement). e. in case of candidates from Government / Quasi Government / PSU, the application should be forwarded through proper channel or No Objection Letter from the present Employer has to be produced at the time of Interview. f. Candidates are requested to check their eligibility criteria with regard to age, Qualification and experience against the advertisement.